Awards such as, however not limited to, cups, trophies, medals, ribbons, plaques, and banners are not guaranteed to be provided and may or may not be provided at any time, and with or without any explanation, at the sole discretion of the CAHL - Calgary Adult Hockey League and may vary in any way from season to season, division to division, team to team, and player to player. The CAHL Cup is awarded to the CAHL playoff champion. The CAHL Cup is retained by the CAHL to be awarded to the CAHL playoff champion of each division for every season. The CAHL Playoff MVP Trophy is an award given to the most valuable player to his or her team in the CAHL playoffs. The winner is selected by the officials at the conclusion of the final game of the CAHL playoffs. The CAHL 1000 Points Trophy is an award given to the player who reaches 1000 career regular season points. The CAHL 500 Goals Trophy is an award given to the player who reaches 500 career regular season goals. The CAHL Silver Medals were awarded and given to the CAHL playoff champion runner-up from the CAHL 2004-2005 Season to the CAHL 2015 Summer Season. The CAHL Silver Medals were only awarded and given to the CAHL playoff champion runner-up from the CAHL 2015-2016 Season to the CAHL 2016-2017 Season for the 9PM Weeknight Divisions I-II. The CAHL Bronze Medals were awarded and given to the CAHL playoff champion second runner-up for the CAHL 2005-2006 Season. The CAHL MVP Trophy was an award given to the player who had the highest percentage of his or her team's scoring points at the end of one CAHL regular season from the CAHL 2004-2005 Season to the CAHL 2007 Summer Season. The CAHL Overall Top Scorer Trophy was an award given to the player who had, out of all of the divisions, the most overall scoring points at the end of one winter CAHL regular season for the CAHL 2011-2012 Season. The CAHL Top Scorer Trophy was an award given to the player who has the most scoring points at the end of one CAHL regular season from the CAHL 2004-2005 Season to the CAHL 2010 Summer Season. The CAHL Overall Most Goals Trophy is an award given to the player who had, out of all of the divisions, the most overall goals at the end of one winter CAHL regular season for the CAHL 2011-2012 Season. The CAHL Overall Top Scorer Trophy was an award given to the player who had, out of all of the divisions, the most overall assists at the end of one winter CAHL regular season for the CAHL 2011-2012 Season. 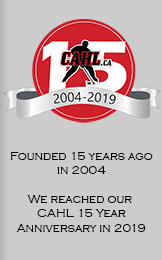 The CAHL Top Defenceman Trophy was an award given to the defenceman who had the most scoring points at the end of one CAHL regular season from the CAHL 2004-2005 Season to the CAHL 2009-2010 Season. The CAHL Overall Top Goalie Trophy was an award given to the goalie who had, out of all of the divisions, the lowest goals against average at the end of one winter CAHL regular season for the CAHL 2011-2012 Season. A minimum of 20 games played for the winter regular season. The CAHL Top Goalie Trophy was an award given to the goalie who had the lowest goals against average (a minimum of 15 games played for the winter season and a minimum of 6 games played for the summer season) at the end of one CAHL regular season from the CAHL 2004-2005 Season to the CAHL 2010 Summer Season. The CAHL Top Female Player Trophy was an award given to the female player who had the most scoring points at the end of the CAHL regular season from the CAHL 2004-2005 Season to the CAHL 2006-2007 Season. The CAHL Top Female Forward Trophy was an award given to the female forward who had the most scoring points at the end of one CAHL regular season from the CAHL 2007 Summer Season to the CAHL 2009-2010 Season. The CAHL Top Female Defence Trophy was an award given to the female defence who had the most scoring points at the end of one CAHL regular season from the CAHL 2007 Summer Season to the CAHL 2009-2010 Season. The CAHL Top Female Goalie Trophy was an award given to the female goalie who had the lowest goals against average (a minimum of 15 games played for the winter season and a minimum of 6 games played for the summer season) at the end of one CAHL regular season from the CAHL 2007 Summer Season to the CAHL 2009-2010 Season. The CAHL 100 Point Season Trophy was an award given to each player who had 100 points in one winter CAHL regular season from the CAHL 2006-2007 Season to the CAHL 2011-2012 Season. The CAHL 50 Goal Season Trophy was an award given to each player who scored 50 goals in one winter CAHL regular season from the CAHL 2006-2007 Season to the CAHL 2011-2012 Season. The CAHL All-Star MVP Trophy was an award given to the most valuable player of each team in the CAHL All-Star Games during the winter seasons from the CAHL 2004-2005 Season to the CAHL 2011-2012 Season. The winners were selected by the officials at the conclusion of the CAHL All-Star Games. 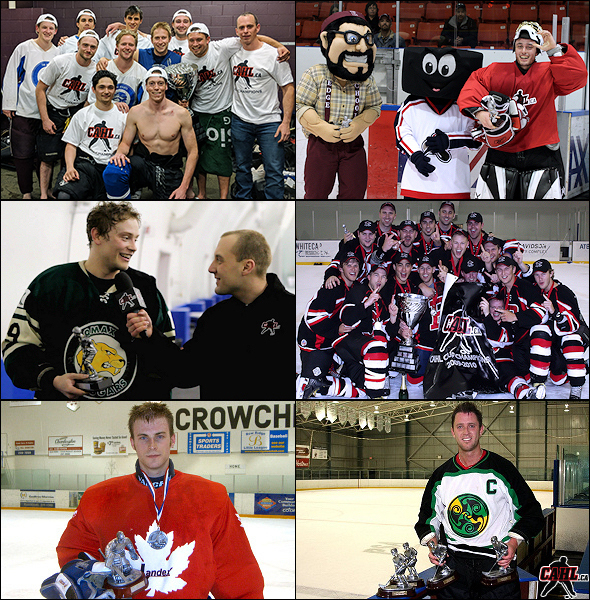 The CAHL Named in Honour Trophy was an award given to the player who best demonstrates honour, determination, and devotion to CAHL ice hockey. The trophy was named in honour of each winner. This was a nomination based award and the winner was selected by the CAHL. It was awarded during the CAHL 2007 Summer Season.